So today was the day that Canada over the chairmanship of the Arctic Council. Unfortunately, not a lot has changed since I wrote my original blog post on the Arctic Council a few months ago. Disputes still haven’t been settled, the arctic still remains a frozen treasure trove of untapped resources and the environment and climate change continue to be an issue that hounds the Harper Government. To mark this occasion I repost my original post from the theriskyshift.com about Canada and the Arctic Council . This coming May, Canada takes over the two year chairmanship of the Arctic Council. For those who are not familiar with this organization it is an intergovernmental body of Arctic nations (Canada, US, Russia, Iceland, Norway, Sweden, Finland and Denmark representing its dependencies of Greenland and Faeroes) which pledges cooperation on issues of mutual concern. The organization emerged in 1996 as a part of the so called Ottawa Declaration and most recently in 2011, the Council trumpeted the signing of an agreement on mutual search and rescue responsibilities and capability in the arctic region. For the duration of the chairmanship it is widely expected that the Canadian Government will push an agenda of economic development for arctic regions while encouraging greater involvement of indigenous aboriginal groups. The issue of grappling with the challenges of climate change has not been a priority for the Canadian government (both domestically and internationally) leading to environmental groups challenging its priorities in the face of the risk of ecological disaster in the arctic region due to both climate change and pollution. Most reports have found Canada’s readiness to handle a major ecological disaster in the arctic region to be surprisingly wanting, with one report citing that it would be likely to clean up 5% of oil spilled in the North Atlantic. Beyond this broad agenda there is of course the touchy issue of territorial disputes that are ongoing across the Arctic region. Although it appears that bilateral negotiations and possible resolution under the United Nations Convention on the Law of the Sea (UNCLOS) could see these issues sorted out. Canada has thus far failed to submit its claims and the December 2013 deadline is fast approaching. 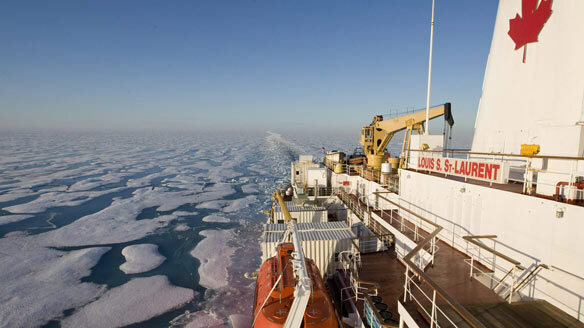 There have been reports that Canada plans on expanding its claims in the high Arctic as well as attempting to enforce the status of its Arctic Archipelago as an internal waterway. The effect of these overriding territorial issues on the ability of Canada to lead the Arctic Council is unknown but the fact remains that ongoing disputes with Russia, the United States and Denmark all have outstanding disputes with Canada that have yet to be resolved. Canada’s perspective Chairwomen, the Honourable Leona Aglukkaq (Canadian Minister of Health and Minister Northern Economic Development) not only faces challenges from within the organization but also outside groups attempting to gain a seat at the table. China, South Korea and the broader European Union have all made petitions for permanent observer status at the Arctic Council as a means to have their voice heard in the forthcoming rush for development in the far north. This expansion of the Arctic Council poses many challenges for Canada as the larger the institution becomes the less Canada’s voice will be valued. Being realistic, the organization is already geopolitically unbalanced with the United States and Russia being the “polar bears” in the room with their acceptance of agreement being nominally required for them to move forward. The adding of the European Union, China or others even in an observer role would further dilute the Council’s ability to reach consensus on vital issues. The next two years will be defining for both Canada and the Arctic region, as the ice sheet continues to dissipate in the summer months the pressure from multinational corporations and non-member governments to develop this vast untapped wilderness will be immense. The Canadian government seems poised to pursue an agenda of economic development while thumbing its nose at its neighbours by claiming vast stretches of seabed. All the while, environmentalists worry about an ecological apocalypse in the region and circumpolar aboriginal groups call for greater representation and decision making power.